https://globaldevincubator.org/privacy-and-legal/ buy now With the lost hour due to daylight savings yesterday I didn’t get as far as I wanted to with my Sunday sewing. I shared in my last post that, among other things, I am working on a fabric Easter basket for our granddaughter’s first Easter. Here’s my progress report so far. You might recall that I decided to cover 200 feet of clothesline last week. The clothesline I had on hand came in a 100 ft package, but it was easy to add on using a second package, I just wrapped the end of the first cord with a little piece of tape to attach to the beginning of the next cord, then continued with my sewing. I didn’t count how many strips I cut from my pink stash (3 of each fabric but I don’t know how many fabrics I had). Based on 40” of usable fabric (due to diagonal joining of strips) I figure it took 30 strips to cover 100 feet, which means I have 60+ in my project. I did have more strips than clothesline so I left it attached to the long fabric strip in case I find my basket needs more fabric cording, I won’t know until I get to that point, but if I need to add more clothesline or more fabric that’s an easy thing to do. Rolling the trimmed cording wasn’t difficult but rolling a yarn ball is a tad easier and neater. This too took some time away from my Sunday sewing but will prove to be worth the investment when I am constructing the basket as I won’t have to take time to untangle! Don’t you just love how all the pinks are playing nicely together! This is what 200 feet of trimmed fabric covered cording rolled into a huge ball looks like. Since I want to make an oblong basket instead of a round one I began the base by measuring a desired length (I just guessed) then doubled back to start joining the cords together. I set the machine for a triple zigzag – or broken zigzag as I’m not sure of the proper term. It’s a zig zag that takes an extra zig before it zags again – in other words the needle hits several times assuring me that I can take an extra nip in each cord to secure the join. I started out thinking that my variegated thread Aurifil 2660 would be pretty but there were times I thought it too pale so I quickly switched to a solid hot pink Aurifil 2530 and I think I will like that better. The process is rather simple, just coil the cording around the center like a yummy cinnamon roll. The trick is to keep the needle in the center between the two parts, to tuck the raw trimmed edge under, and to make sure the base is laying flat. Can you see the difference in changing thread? I think if the variegated had been darker instead of pale it would have worked, but I am pleased with the new color on the outer rounds, aren’t you? Sometimes when I go fast around a corner I might miss catching both cords. From past experience I have learned to stop and check every now and then, taking time to repair as needed. I have a few older bowls that have these loose spots. Trust me, there comes a point where you can’t get a location back under your needle as the bowl grows. Better to take time to check and repair than to have to do a little hand sewing later. Ask me how I know! After a few rounds I check to see if any areas need repair – much easier to do at this point than later when the basket has grown! Some may ask why I’m covering the cording instead of using a wrap method. Two reasons, (1) this makes for a smoother finish without raw edges on all sides of the cording, and (2) it’s how I was taught when I made my first basket over ten years ago. Grin. I was just getting a good start on the base when I found I was out of my allotted sewing time. Sigh. This is why I started early! Yep, a month of Sundays and I hope to have an Easter Basket for Reagan. I put together a short synposis of the steps I’ve taken so far in a video which does include a brief “live action” sewing to better explain the process. 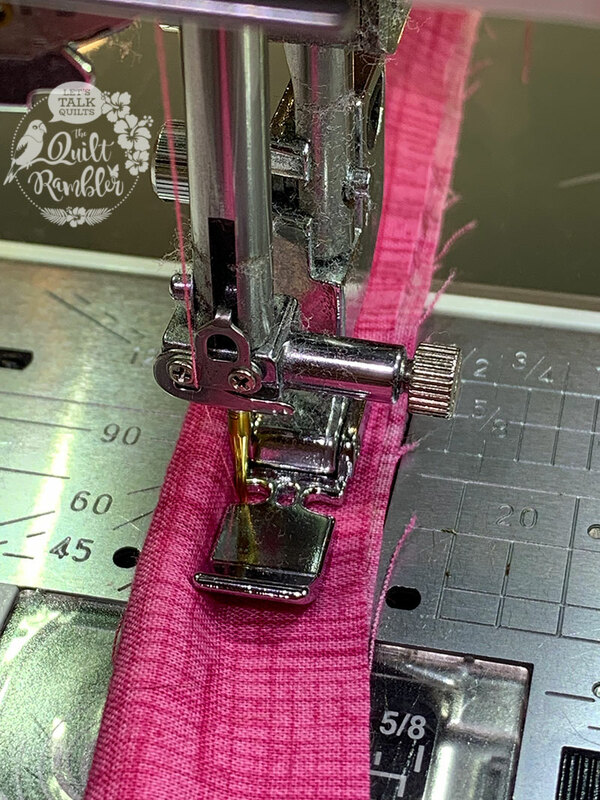 I hope you will find this useful and stayed tuned, better yet, why not catch up and join me on this sewing adventure! In the meantime it’s back to the to do list. I managed to finish quilting my secret project, did a quick machine binding (don’t judge me, remember I fired the quilt police – besides I doubt it shows in the photography), hand sew the label on the back and ship it off this morning. Check, check, check! I did take advantage of the sunshine on Saturday and did a little shopping at an outdoor outlet mall this weekend – getting ready for some rambin’ road trips coming up! A quick peek at Facebook this afternoon showed that Reagan was enjoying the sunshine today too! Can’t help but smile when I see those chubby cheeks! This is Karen Overton, The Quilt Rambler, ready for a fun filled week ~ giving you permission to redeem that lost hour by doubling your time in your sewing room this week! Thank you!!! I am looking forward to seeing how you start making the sides!!! This s going to be a beautiful basket!! !